Using your soundcard's analog-to-digital and digital-to-analog conversion capabilities, WinWarbler allows you to conduct QSOs using the PSK31 operating mode developed by Peter Martinez, G3PLX, the double-speed PSK63 variant, and the quad-speed PSK125 variant. 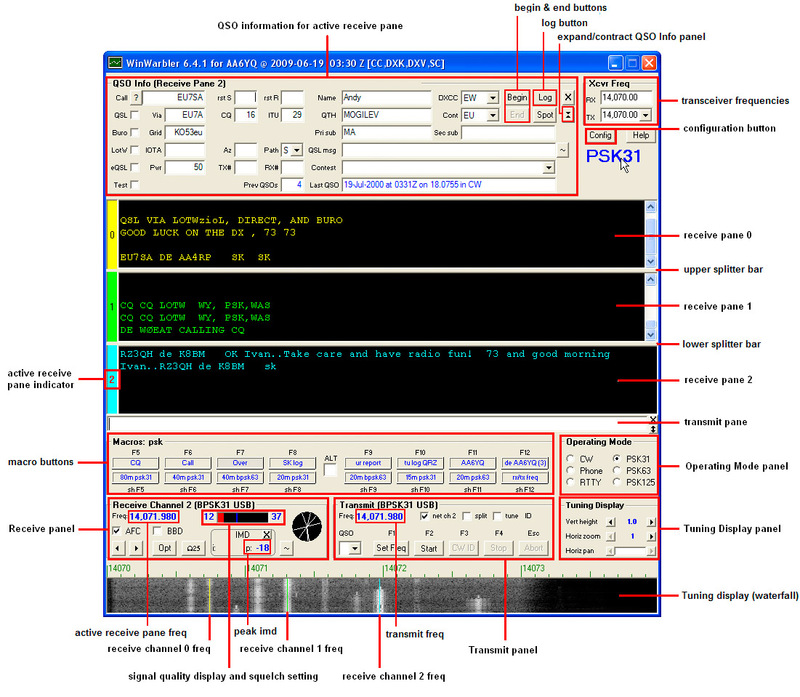 Using AE4JY's PSKCORE engine, WinWarbler can simultaneously decode PSK transmissions on three separate frequencies; each decoded transmission is displayed in its own receive pane. WinWarbler graphically presents a 4 kHz spectrum, allowing you to choose frequencies by simply pointing and clicking with your PC's mouse. To begin PSK operation at the desired speed, click the PSK31, PSK63, or PSK125 button in the Operating Mode panel located on the right side of WinWarbler's main window. You can specify a set of commands to be executed whenever WinWarbler switches to PSK31, PSK63, or PSK125 mode by setting up a PSK startup macro.